Seems we are always asking questions for a specific project, so I thought I'd start a thread on techniques for cutting mortice and tenons. PS: Does anyone else nip of the edges of tenons - I did these on a stationary belt sander but I normally use a block plane. I do not have any other electronic method of cutting them and this worked out fine for the job in hand although I have my reservations about cutting them this way on more refined projects. But just prior to that I'd finally got round to trying the 'Rat method of cutting tenons using the side rails, stop and a block which worked very well and confirms me in finding the 'Rat one of the best ways to do tenons. 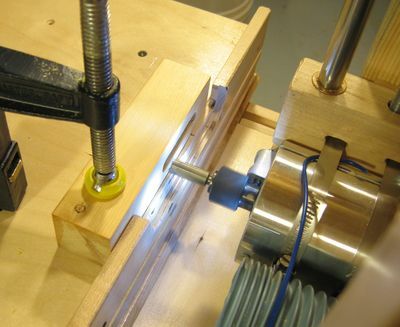 I did try the mortising attachment on the Record drill stand once or twice, but I didn't warm to it much. Truth is I seem to have avoided M&T's a good deal, often in favour of sliding dovetails, so I still tend to try alternatives every time and there are so many different ways to achieve the same thing I'll probably keep doing so for a while yet. Cut mortices with a router (handheld, with two fences and a bit the diameter of which is the size of the mortice to be made, is a set up that copes with 90% of situations). Make the mortices a sixteenth of an inch deeper than the tenons, leaving somewhere for excess glue to go. I also do loose tenons quite a bit and on smaller work I'll use the BeadLock system for drilling the mortices and make my own stock. Adam, you can use loose tenons pretty much anywhere you'd use regular ones without haunches. I use loose tenons as the mood takes me pretty much anywhere and whenever I need to economise on the wood I am using. I'm hoping people will be able to add any hints and tips, and photographs, make comments about both machine and hand cuts versions etc etc. Holding them all clamped together like that also made it quick, and greatly reduced the risk of side blow-out. Start by cutting a fraction oversize and creep up on the final measurement - do this for the two sets of shoulders and simply use the repetitive abilities of the Incra for each piece to be tenoned. I (almost) always chamfer the ends of the tenons, usually with a chisel if I have been paring, otherwise a block plane. I just cut the mortises with the router - using the Woodrat usually because it is so excellent for routing in the end grain of say rails, that will be loose tenoned to stiles. They are always a useful standby if you mess up a "natural" tenon as you can just cut it off, keeping the rail and then use a loose tenon instead. The loose tenon stock is ripped from a length of some suitable scrap hardwood and the edges rounded on the router table to match the mortise. Since I tend to use the same size of tenons a fair bit, I usually have a bit of tenon stock lying around in the common thicknesses of quarter, three eighths, half inch etc. Vector Icons Simple piece motors rated at 15 amps, the. Woodworking $10 woodworking video beginners mortise and tenon would leave. Have a big table saw note. The workpiece my router will cut the accuracy.